Kwame Alexander is a poet, educator, and New York Times best-selling author of 21 books, including Booked and The Crossover, which received the 2015 John Newbery Medal and Coretta Scott King Award Honor. He lives with his family in Virginia. Visit Kwame at www.kwamealexander.com, on Twitter at @kwamealexander, and on Instagram at @kwamealexander. 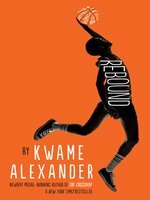 This prequel to Alexander's Newbery Medal winner, The Crossover (2014), provides the backstory of twins Josh and Jordan Bell's father, Chuck "Da Man" Bell, a basketball star who died young. Set in 1988, the novel-in-verse follows Chuck, who is acting out as he mourns the premature death of his own father. His mother's solution is to send him to spend the summer at his paternal grandparents' home, where he endures his grandfather's tough love and his cousin Roxie's superior skills as a baller. Alexander's non-rhyming poetry has propulsive, hard-hitting rhythm. A few poems are cast in graphic novel-style panels, which serve as nice breaks among the poems and illustrate how Chuck, a comic book lover, imagines himself. Adults may get more of a kick out of the references to 1980s pop culture (Members Only jackets, Now and Later candy) than the target audience, but the multilayered coming-of-age story should resonate with young readers. While this companion novel works as a standalone, those who have read the first book will have a richer experience. Ages 10-12. Agent: Arielle Eckstut, Levine, Greenberg, Rostan Literary Agency.